A smooth blend of cultural happenings and infatuations. By translating this process of production into an artistic medium, Haifeng creates something that is entirely conceptual in its essence. It cannot be used for individual, material gain and it seemingly has no economic use. Following the terms of consumerism, it is rendered useless. As advanced, industrial nations increasingly outsource the laborious tasks of production to Asian countries, before importing back the finished product, Ni Haifeng believes that “a global re-configuration of labour division has occurred,” in which China, among other developing countries, has become the collective working-class of global capitalism. 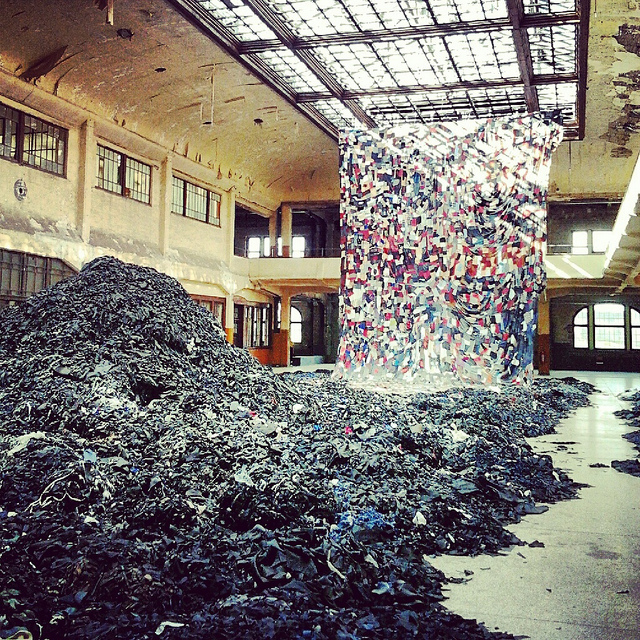 In his instalment, a plummeting wave of textile shreds are stitched together into one, huge cloth that pours down from the ceiling. 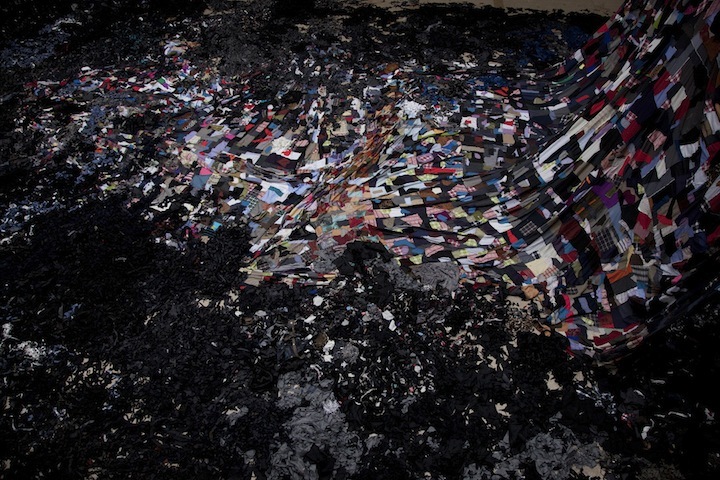 These shreds make up ten tonnes of left-over fabric from China’s sweatshops, equalling the waste-material of aprroximately ten days of production by a single Chinese manufacturer. Mounted in this way, it appears to flood in through the glass windows from an unknown, remote source , reminding us of the absent role Western consumers play in the creation and seemingly have no real concern as to where it all comes from. At the heart of consumerism, these products are exalted for their economical purpose, their sought after financial profit and a whole host of necessities dreamed up by advertising masterminds. 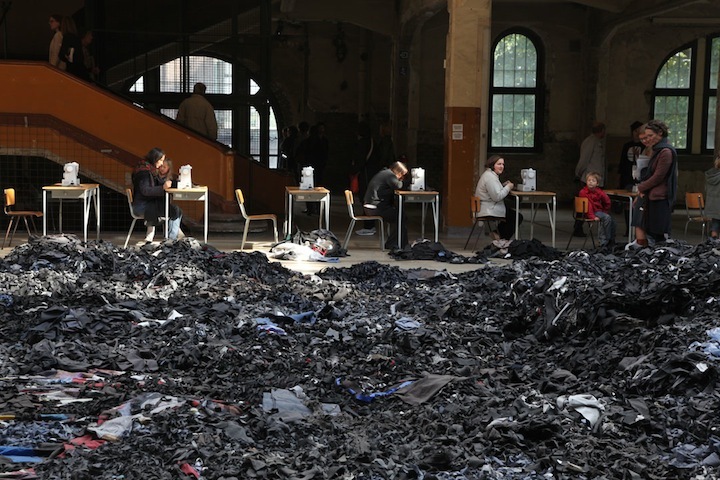 Yet, as Haifeng’s brightly coloured fabrics spill out into the room, they quickly fade into crumbling, ash-like mounds, exhorting the underlying truth to Capitalism – the sheer futility of the products that flood across our borders, their sole purpose being to fuel our insatiable desire for materialist excess. It’s a source of such abundance, that these products are shoved ruthlessly aside to make room for the endless influx, reduced eventually to piles of unwanted, forgotten rubbish. If we think of all the cluttered attics and the basements crammed with dusty boxes across the world, this sounds about right. Yet, as well as highlighting the frivolity of these commodities for the consumers, Haifeng illustrates an identical condition on the producing end. The Chinese manufacturers have no chance to experience the final product they labour over, as they’re swiftly shipped across the planet for others to enjoy. The success and popularity of the products they produce play no role in the level of income they receive for their work. For them too, Haifeng proposes that these individual products have no real meaning. Not only does Hiafeng denounce the central function that drives this process, but he subverts its course of direction, drawing attention to the forgotten individuals that put it in motion. Sewing machines set upon tables line the room, inviting gallery visitors to participate in sewing these fabrics together themselves. The people who so thoughtlessly consume Chinese products instead sit together in rows, working together to produce something for a Chinese individual. By involving Western consumers in a process that is deemed “useless” in terms of consumerist ideals, Ni Haifeng invites them to witness the process from the other side. It similarly allows the consumer to become an individual in the process, rather than simply the lavish, united mass on the receiving end. Ni Haifeng provides a comparable conclusion for those at the other end of the process; the nation driving this consumer culture. While the resulting products hold no true meaning or use for the consumer, it appears to be a similar outcome for the producer. What results is a process that has wrapped itself intricately around the entire world yet that seemingly lacks any true essence. Producer and consumer are ultimately united, despite their apparent alienation from one another. In this accumulation of meaninglessness, Haifeng leaves us with a conceptual, artistic entity that is devoid of any real “use” when observed through the chronically prevailing vision of consumerism. Through his debasement of this production process, he imbues artistic creation with an authentic meaning, one that is independent of the meaning we attach to the material, procured creations that dominate our lives. In this way, Haifeng’s appraisal of his work’s “zero degree of meaning” is justified as he, with pride, extracts it from the consumer process and invites others to follow suit, into an alternative understanding of meaning.